Your college days are going to be some of the most unforgettable moments of your life. These years can also be full of firsts for most students. Perhaps, living away from your home and family will be a new experience for you. At WsYOU/Bluff City Properties, we can ease this transition by offering you quality off campus housing in Winona. 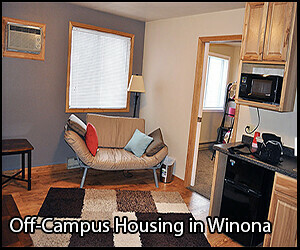 Off campus housing in Winona includes various amenities. At WsYOU/Bluff City Properties, we understand how important comfort and convenience is for students who are living on their own. From cozy lounges to beautiful kitchenettes, we have you covered. Our quality, off campus housing in Winona, Minnesota will surely be your home away from home. Off campus housing in Winona offers more space. University dorm rooms tend to be more cramped compared to the ones in off campus housing in Winona. You will always have your privacy in a place you can call your own when you live in off campus housing in Winona. Off campus housing in Winona helps you become more independent. When you start living on your own, without roommates, you become responsible for your daily life. By living in off campus housing in Winona, you can prepare yourself for life after graduation. Eventually, paying bills and shopping for groceries will even become natural for you. Off campus housing in Winona is more cost-effective. College tuition fees can be quite expensive. As a student, you need to ensure that you make practical choices to save more money. If you are searching for an apartment, then off campus housing in Winona, Minnesota is the best choice for you. You need to know everything about the establishment and neighborhood when you are searching for off campus housing in Winona. At WsYOU/Bluff City Properties, we do our best to keep our residents protected from harm. Our selections of off campus housing in Winona are guaranteed secure. If you have narrowed down your options for off campus housing in Winona, then you should schedule a tour. Compare the properties to see which off campus housing in Winona, Minnesota is best suited for your lifestyle and needs. When searching for off campus housing in Winona, you need to consider its distance from your university or college. At WsYOU/Bluff City Properties, we have what you need. Get in touch with our staff to learn more about our off campus housing in Winona. Many college students try their best to find the perfect off campus housing in Winona, Minnesota. If you have found the right one for you, you need to make sure that you reserve it as soon as possible. Our company offers a 48-hour hold for individuals who are interested in our quality off campus housing in Winona. At WsYOU/Bluff City Properties, our compassionate and friendly staff works hard to make your stay as comfortable as possible. If you are interested in our off campus housing in Winona, please get in touch! We look forward to hearing from you.